The supervision of a poet, architect and an aesthete has led to the formation of the building of a city, beauty, balance and symmetry. What leads you to a romance with the city of Hyderabad, is the love story of a young prince and a village belle that laid the foundation of the city. Hyderabad is the city of Nizams known for its bead and pearl work done dexterously. The love story related to the foundation of the city of Hyderabad narrates that a young prince, Muhammad Quli fell passionately in love with a maiden from Chichlam village across the river Musi. Ibrahim Qutb Shah, his father, built a bridge on the river to protect his life. When he ascended the throne, Muhammad Quli built the Charminar at the site of the village. The city was called Bhagnagar (the city of fortune) to appease his beloved, Bhagmati. Later on it was renamed as Hyderabad. Hyderabad was modeled after Isfaan in Iran and was built under the supervision of the prime minister Mir Momin, a poet, architect and an aesthete. The construction of the city was completed in 1592. 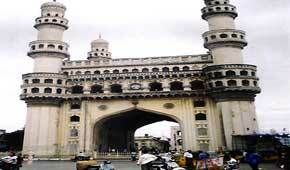 It has a grid plan of two broad intersecting streets with the Charminar as a kind of triumphal arch at the center. The French traveler, Tavernier in 1652, compared Hyderabad to Orleans 'well built and opened out' and in 1672, Abbe Carr was much impressed by the city as the trade center of the countries in the East. The Charminar- Has four wide roads radiating in the four cardinal directions. The structure is square, each side measuring 100 feet, with a central pointed high arch at the center. The whole edifice contains numerous small decorative arches arranged both vertically and horizontally. The projected canopy, ornamental brackets and decoration in stucco plaster add graceful elegance to the structure. The upper courtyard was used as a school and for prayers at the mosque. The minarets, their domed finials, rise to 180 feet from the ground. The Galleries Of Charminar - There are two galleries in it, one over another, and all over a terrace that serves for a roof, bordered with a stone balcony. In its heyday, the Charminar market had some 14,000 shops, a unique conglomeration of a grand oriental bazaar. The whole market around the Charminar is crowded with shops of glass bangles in rainbow colors - Red, blue, green, yellow, orange, mauve and pink-and many more. The Mecca Masjid - - Near the Charminar stands the Mecca Masjid, whose construction started by Muhammad Qutb Shah in 1617 and completed by Quranzeb in 1693. 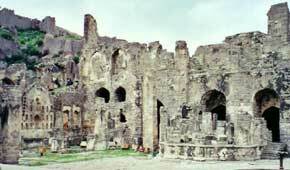 It is a grand edifice with a huge courtyard, which can accommodate nearly ten thousand men at prayer. The other two mosques--the Jami Masjid and the Toli Masjid-are small and modest structures in the city. The Falakuma palace, the Chowmukha palace, the Regency Mansion, built in 1803, the Husain Sagar Lake, Naubat Pahad, a hilltop crowned by the Birla temple, Osman Sagar and Himayat Sagar, the Nehru Zoological Park the Salar Jung museum are some other tourist places. Pearls- The Qutb Shahi rulers and the Nizams loved pearls and diamonds and therefore the pearl work flourished in Hyderabad. The Asaf Jahi Nizams not only wore ropes of pearls studded with diamonds as part of state regalia but also used paste of crushed pearls as beauty aids. Osman Ali, the richest of the Nizams stored pearls and diamonds in sacks in basement chambers. The flourishing trade of pearls at Hyderabad attracts tourist and connoisseur alike. Bidriware - Hyderabad is also famous for Bidriware, a type of encrusted metalwork where one metal is inlaid or overlaid on another. It looks similar to damascene work (koft gari) with gold or silver. Originating from Bidar, this art achieved perfection in Hyderabad. Bidriware derives its beauty from the contrast created by the inlaid metal-gold silver or brass against the black background. Kat Saris - The Kat saris, the traditional saris of Hyderabad turn women irresistible for shopping. The other popular variety of saris is from Siddipet, Dharmavaram, Narayanpet and Gadwal. Also typical of the state is Kalmakari-the hand painted fabric, and Nirmal painting, using dyes to create memorable scenes from the Mahabharat and the Ramayana. The capital city of Hyderabad is well connected to most of the major cities in India and overseas through an excellent air network. There are flights to Kuwait, Muscat, and Sharjah. The airport is at Begumpet. Auto-rickshaws and taxis are also available for local transport. The two important railway stations are Hyderabad or Nampally and Secunderabad. Secunderabad is the main station offering trains to all the major towns/cities of the country. Of the several bus stands in Hyderabad, the main one is the Andhra Pradesh State Road Transport Corporation (APSRTC) Hyderabad. The Jubilee bus stand at Secunderabad is also very busy covering the important destinations.